I am reading Einstein's book, "Relativity: the Special and General Theory" translated by Robert W. Lawson, and I have some questions concerning Special Relativity -- specifically, the thought experiment of the simultaneous lightning. There are two reference frames: coordinate system R which corresponds to the embankment and coordinate system R' which corresponds to the train. For simplification, these coordinate systems will have an x (horizontal) component and a t (time; vertical) component. 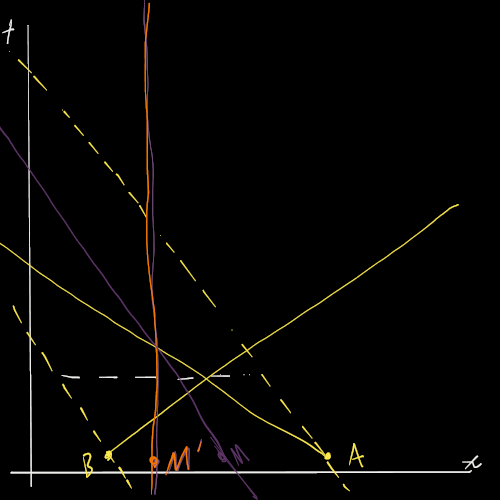 In coordinate system R, points A and B are the positions of the lightning strikes (where $A_x < B_x$). 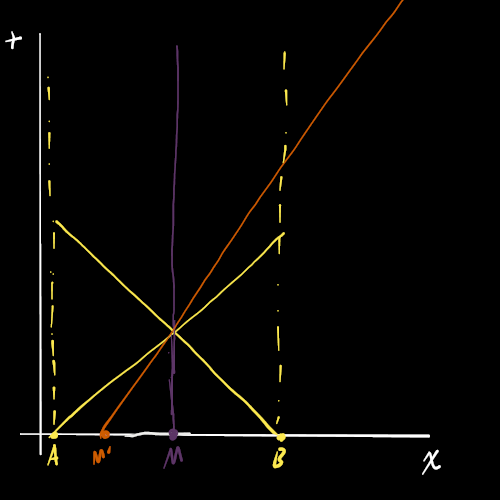 Point M is the midpoint of A and B (along the x axis; it's time component is arbitrary). Ray A (slope of 1) and ray B (slope of -1) represent the change of position versus time of two photons emitted by A and B respectively. Line M (vertical) represents the (lack of a) change of position versus time. Note: the greater the slope of a line, the less the speed because time is the vertical component in this example. An observer stands at point M without moving in reference to coordinate system R. If he observes the light from both lightning strikes simultaneously (i.e. he and both photons, or rays A and B and line M, intersect), then the lightning strikes are simultaneous. A train is moving along the embankment at a constant velocity. Given any point on the train, a line can be drawn on coordinate system R to show its position versus time. The slope of that line is $s$. Construct a line with a slope of $s$ from the intersection of rays A and B and line M. The point on the train which corresponds with this line is M'. A less abstract way to choosing point M' is simply whatever point on the train be in the same x position as both photons and the observer at point M (let's assume the observers and the train are both ghosts that can pass through each other -- welcome to one dimension) in the reference frame of the embankment. Where the dashed yellow lines represent that A and B do not move relative to the embankment, the solid yellow lines represent the light emitted from A and B, the solid orange line represents the change in position of M' relative to the embankment, and the solid purple line represents that point M is static to the embankment. The point where all the lines intersect represents the moment in time and the position of both observers as they observe the light from both lightning strikes as simultaneous. When the lightning strikes, point M' is closer to A. Now, don't worry about how we said, "When this happens" as we're trying to define simultaneity because point M' is closer to A at any time before any light from any lightning strike reaches the observer. In classical mechanics, the speed of light would be slowed down coming from A because the source is moving away from the train (or the train is moving away from the source), and the light from B would be moving faster. Therefore, in classical mechanics, the viewer on the train would see both lightning strikes as simultaneous. However, if we accept that the speed of light is constant in any inertial frame of reference, then the light emitted by points A and B will both be the same. Therefore, the observer at point M' will see the light from A before he sees the light from B. Note that line M' was chosen as a vertical line that passes through the midpoint of A and B at the time of the intersection of both photons. Of course, how do you define "at the time of the intersection"? Also note that while rays A and B are represented as starting at the same time component, that is not necessarily accurate. After conducting this thought experiment, Einstein explained the Lorentz transformation. Now, if the point of intersection in the coordinate system R is $(C_x, C_t)$, then you can use the Lorentz transformation to find that same intersection in the coordinate system of R'. However, we just showed that no such intersection exists. Did I do something wrong with my diagrams? Am I misunderstanding the thought experiment? Or did I misapply Lorentz transformation? I haven't plugged in any values, but it seems to me that if I applied the Lorentz transformation for each point in R, (A, B, M, and M'), I would have gotten the points that correspond to those points in R' such that the light rays would still intersect at point C' (whereas they intersected at C in coordinate system R). Wouldn't that imply that both the observer on the embankment and the observer on the train would observe the two events to be simultaneous (contrary to what Einstein said) whereas the actual start times of the lightning strikes (A' and B') would have different time values proving that they were, in fact, not simultaneous in the reference frame of the train even though the observer in the train would observe them as simultaneous? Wouldn't that, in turn, show that Einstein's definition of simultaneity is incorrect (after all, the observer on the train who fit the qualifications of Einstein's definition of simultaneity observed the lightning strikes as simultaneous when they were not)? And if the Lorentz transform is derived from that thought experiment -- or is it? -- wouldn't that make the Lorentz transformation false as I just used it to disprove the thought experiment that derived the transform? Your second diagram is wrong. If $A$ and $B$ happen at the same time in $R$, they will happen at different times in $R'$. The light rays should still intersect with $M'$ in both reference frames. The fact that $A$ and $B$ happen at different times in the moving frame falls out of directly applying a Lorentz transformation. Not the answer you're looking for? Browse other questions tagged special-relativity inertial-frames lorentz-symmetry observers thought-experiment or ask your own question. Does the derivation of the Lorentz transformation depend on space having at least two spatial dimensions?